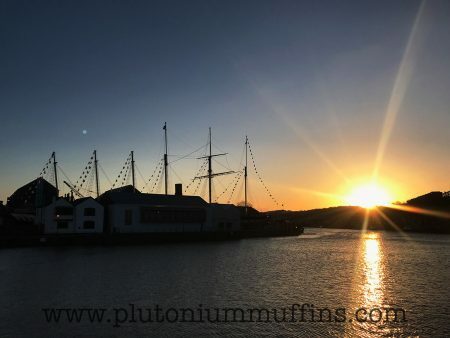 Plutonium Muffins - A healthy source of fibre! 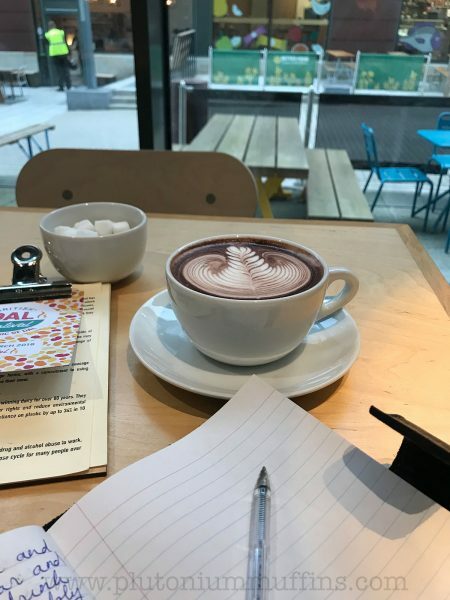 I’m sitting in Pret a Manger writing a blog post I’ve had no idea how to write. 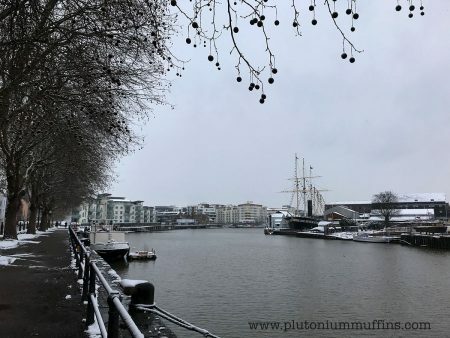 When you take a few weeks of blogging, you suddenly log on one day and realise you haven’t written anything for three months, despite thinking most days “I should write something for Plutonium Muffins”. One of the things I’ve been experiencing this year has been a general fatigue concerning anything to do with social media, the Internet, technology and growing up in a world that doesn’t seem to know which way is up, and how to get by without losing yourself in an endless stream of memes, bad news, and carefully curated and edited photographs by other people that make you think you’re doing everything wrong because you’re the one who hasn’t got your life together. The result of this has been a virtual sabbatical from most things social media. One of the podcasts I listen to (Hello Internet) has two presenters, one of whom has taken on “Project Cyclops”, where he has banned himself from all social media including reddit and Twitter. He doesn’t even listen to podcasts anymore. It’s been interesting listening to him talking about it – somewhat inspirational even. I don’t think going that extreme is something I plan to do, but it’s definitely something I’ve been thinking about. A lot. To add to all of this, the other day I lost my phone following a series of unfortunate and emotionally challenging events. I’m still not sure what is going to happen and if I’ll get it back (let’s just say I’m never using Uber again and I plan to file a police report on Monday). Being 100% isolated from my phone and therefore the rest of the world was a nice and a horrible experience at the same time. I hadn’t realised how much of an effect constant contact with the world was having on me. The chance to have a break for a few days from constant messages, even if it was just my friends sharing interesting articles or talking about the latest news in the world of weddings, was actually incredible. I walked out of my house on Friday morning and felt absolutely untethered in a way that I can’t remember feeling. Ever. 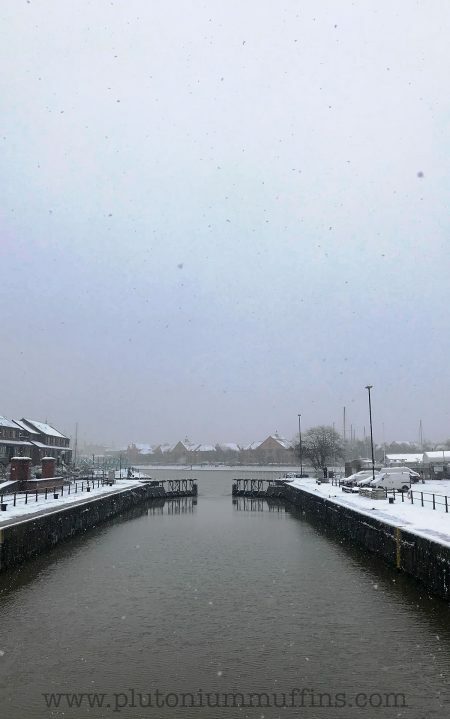 I went for tea breaks at work and didn’t get myself into the cycle of ‘better check Twitter, Instagram, Facebook, the BBC news, WhatsApp messages…right that’s all done back to Twitter, Instagram” on what was supposed to be my break from the screen. Although I don’t post much on any of these places anymore, I am still apparently addicted to checking them. I watched construction workers dig a hole and fill it in. I listened to some birds outside work in the trees. I went to lunch with some people and was the only one not constantly checking my phone. It was nice. 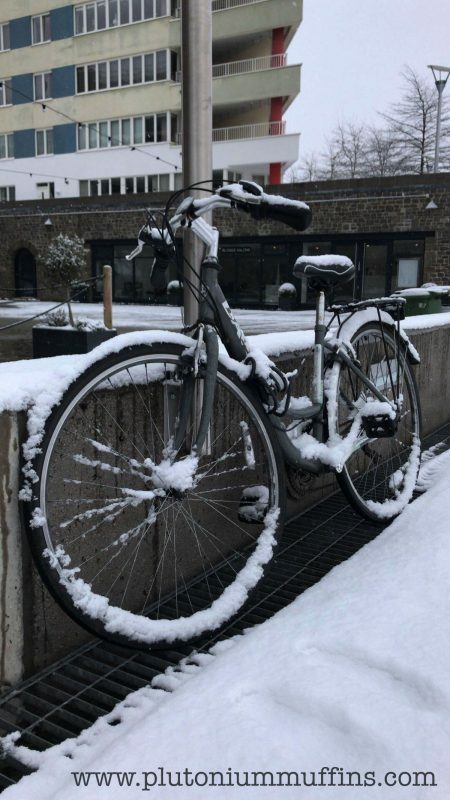 With the spring in my step that was me leaving the house on Friday being surprised by how free I felt, although absolutely baffled as to how I was going to get myself connected again, I left for work without my keys. 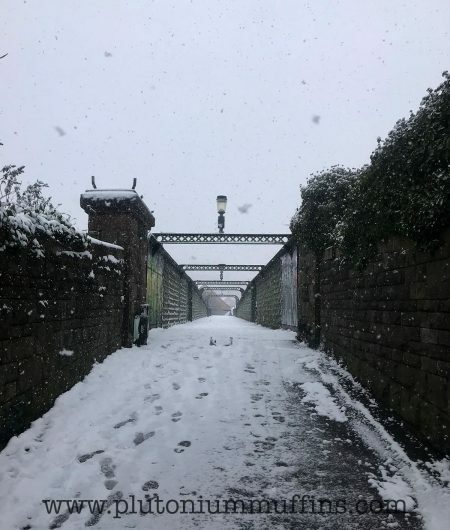 That night all of my housemates would have been out – there was no way for me to find out where they were or how I was going to get in, other than standing outside the house and waiting (which is what I ended up doing, in the rain). 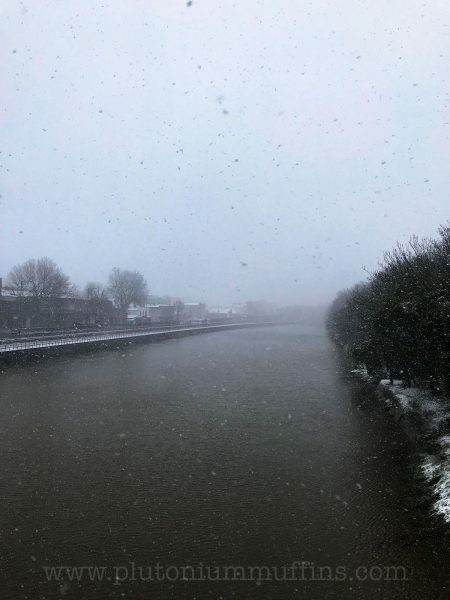 I quickly realised there was no way for me to sort anything out. I had conversations like “have you called Uber yet to get your phone?” “No, I have no phone and I can’t login to my account because they use two factor authentication for which I need a phone” multiple times. I’ve also been going through some emotional stuff this year, and spend probably an hour every couple of days on the phone to my mum, who is my best friend and my closest confidant. Not being able to call her was horrible – I don’t think I’ve felt that alone for a long time. I needed a new phone. I’m by no means a techno wiz, but I do use a smartphone, and the massive hit I’ve had to take to my purse in fixing my own very stupid mistake has created some intense internal debate that I didn’t expect. I spent a seriously long time standing back and debating whether I did in fact need the latest iPhone (I definitely, absolutely don’t) and what the benefit to my life would be if I just bought a phone that was only useful for texts and phonecalls. After irritating the guy in the Apple Store with my hour of dithering, I went for the iPhone, and I’m going to wonder for the next six months if I made the right call or not. It’s sitting next to me now, and I kind of hate how much I needed it, how much I paid for it, and how it’s going to remind me of a horrible experience every time I pick it up. To get back to the point, I don’t know how to write this blog post because I don’t know what this blog is anymore. 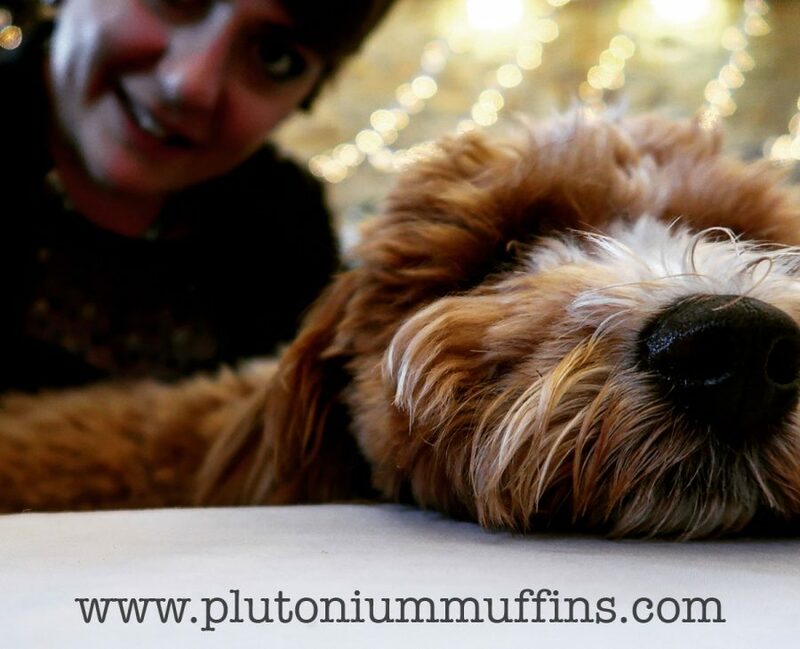 I love to write, and Plutonium Muffins has been a part of my life for seven years (as of last Wednesday, happy birthday PM). However, I don’t have the same passion for writing about the stuff I used to write about. I don’t knit or spin or stitch enough to do weekly update posts. I don’t attend craft events as much as I used to. 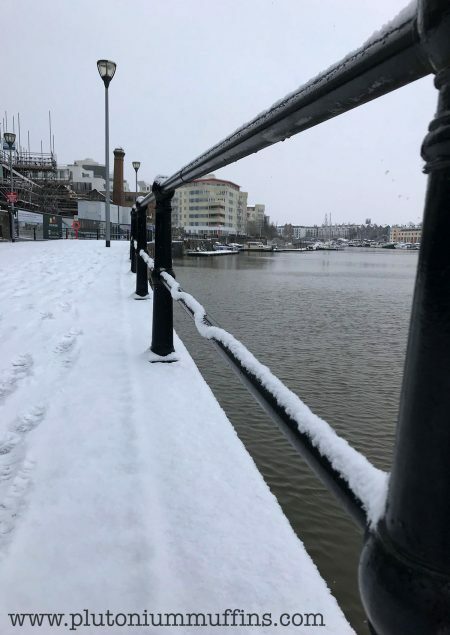 I spend a large proportion of my life at work, either working or studying, and when I get home the last thing I want to do is get my computer out and write a blog post or edit a video. When I do get down to writing I tend to pen these epic tales full of emotional nonsense and personal, private stuff that I don’t want to put out on the Internet. It gets relegated to the folder of “stuff I need to address”, or just deleted and forgotten about, and I don’t like that either. I guess what I’m trying to say is I’ve been trying to figure out what to do with my creative life online, and after two years of soul-searching, as evidenced by my gradual decline here and in other places, I still haven’t got there. I think I need to take a bit of a break from pressuring myself into writing. I’m going to try spend some time making stuff I love and want to share with people. And even if I do love and want to share it, I don’t know if I will. 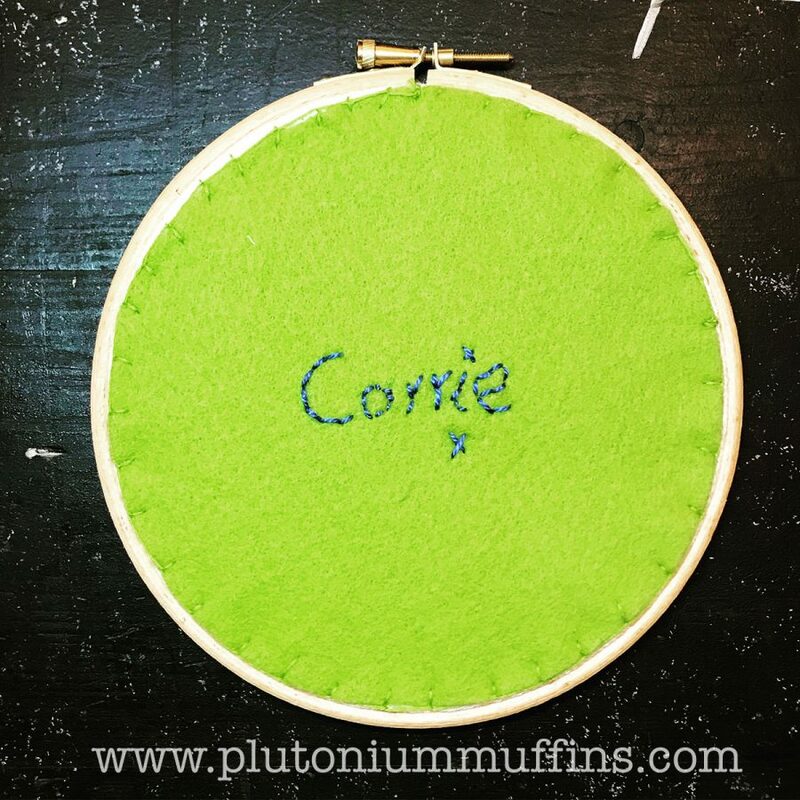 I’ve already changed my Instagram handle away from Plutonium Muffins, and I plan to delete the Facebook page and some of the other things I’ve got in this name. I’m going to go back to being just Corrie for a while, and see what happens. 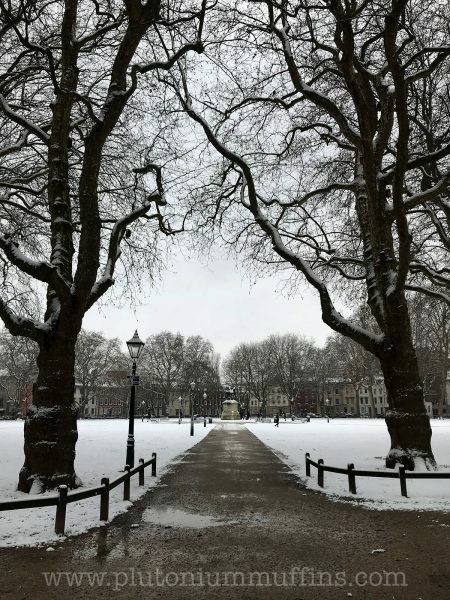 I didn’t expect this post to turn out this way – I was going to come here and write something cheerful and aspirational, about how Christmas is nearly here and 2019 is going to be a better year. I’ve reached the end and re-read what I’ve written with some surprise, and somehow it feels right. With that in mind, I’ll hopefully see you all again. If I don’t, I wanted to say thank you to everyone, it’s been an incredible ride and I have appreciated all of your support, friendship and lively discussion over the last seven years. A couple of weeks ago I went to the wedding of one of my good friends from work and his lovely new wife. 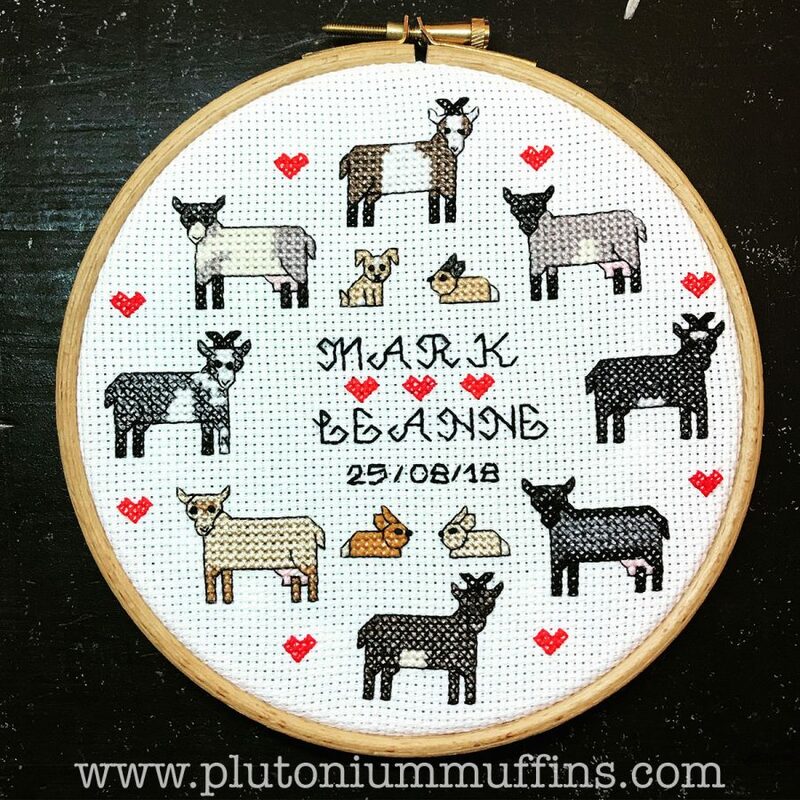 The happy couple are the proud owners of a veritable petting zoo, and I wanted to stitch them a wedding sampler to celebrate their nuptials, personalised with representations of their pets. I filmed the process of putting this together from beginning to end – you can see the video here. When I moved to my current house, I dug through my collection of craft books and identified a stack I wanted to donate to charity/give away. I was persuaded not to with the wise words of “just keep them for a few months and see if you use them”. This advice turned out to be well needed, as Jo Verso’s “World of Cross Stitch” was one of the books I had earmarked for donation, and is what I used to find the motifs I wanted for this wedding sampler. 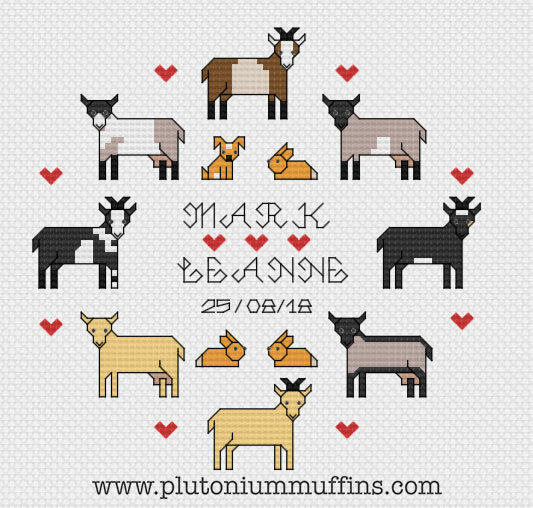 Mark and Leanne have got eight goats, a very cute cavapoochon and three rabbits, so I found motifs representing all of these, and decided to embellish the sampler with hearts to indicate the happy occasion. Some backstitch lettering and a date later, and I had the elements I wanted to include. Me with little Porridge, the cavapoochon puppy. 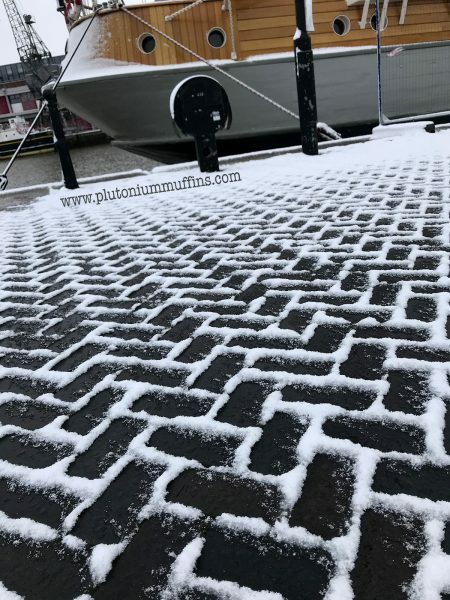 I used MacStitch Prem to assemble the design – the version I use is from 2015 and is usually fantastic, apart from one thing. It crashed halfway through the stitching and I had to reassemble the whole design from scratch as no back-up ever got saved, despite my almost obsessive habit of clicking ‘save’ every 30 seconds. A new version has been released this year – I will buy it as soon as I stop moving house every six months – but I do fully recommend it if you are looking for a cross stitch design toolkit. When I was happy with the shapes of the animals, I then spent many, many hours watching videos of the goats on Facebook to try get the colouring right. The below is what I came up with. I used a random assortment of flosses to stitch the sampler after I was finally happy with the design. With reams of 14ct aida still in my stash, that was the natural choice of fabric. My collection of random flosses from inherited sewing boxes, random trips to supermarkets, and “grab bags” in hobby shops yielded a great combination of colours, and I spent a happy few hours stitching up each little motif. 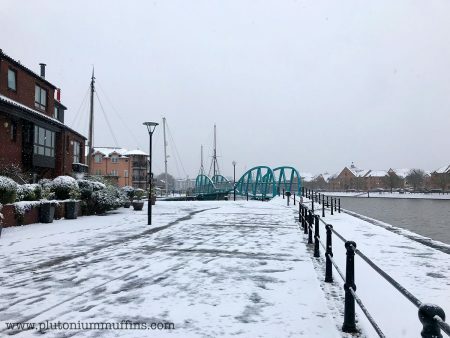 I hadn’t put much time into colour matching with a specific brand of floss or trying particularly hard to be too exact in my colours – my thoughts were “go with my gut”. It was a lot of fun. As much as I love cross stitch, sometimes I get too obsessive about exact colours and being true to life. Letting those constraints go was wonderfully freeing, and I was so pleased with how it came out. The sampler half done. 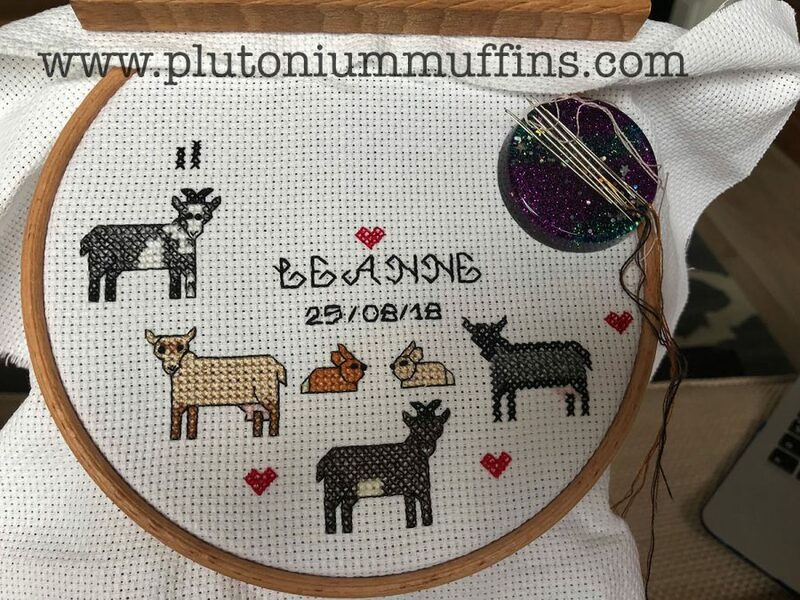 The backstitch on the writing is done with two strands of floss, the backstitch on the animals using one strand. The last time I got a piece framed I decided to get it professionally done behind glass. With the organic nature of the subject matter (and the fact that I hadn’t really left myself much time…. ), I went for a much more vintage, rustic effect – basically, leave it in the hoop and back it with fabric. 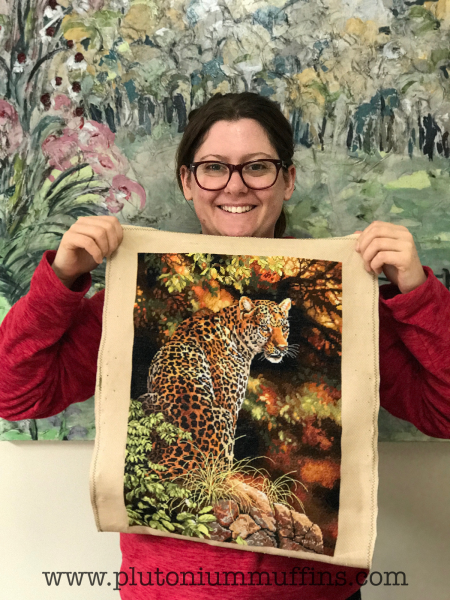 My attempt was quite rough – I was filming for YouTube when I did it and I ended up with quite a wonky circle for the piece of felt that I backed it with – but it complemented the piece almost perfectly, and I was absolutely thrilled with the final product. The finished wedding sampler ready for presentation. And the back, not particularly well done but with a cute little signature anyway! I presented it to them last week, and they were pleased. I was too! This project was a lot of fun, very personalised, great to design, satisfying to stitch, quickly completed and charmingly finished (if I do say so myself). It’s also made me realise that despite cross stitch being a ‘slow craft’, you can churn things out pretty quickly when you need to. I suspect more people will be getting personalised samplers in the future! I’ve got big news coming in the next blog post…more change is afoot and I can’t wait to share it with you. Watch this space! 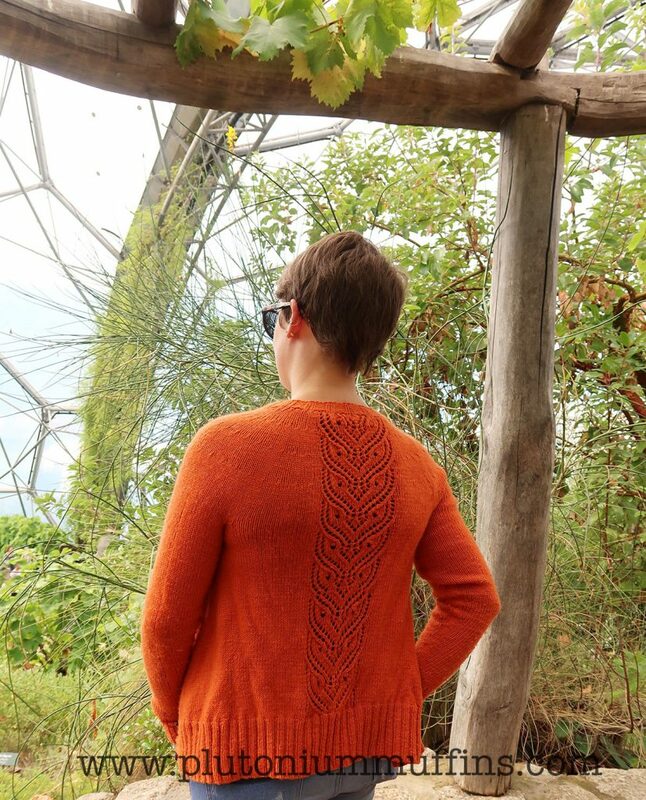 World Cup Cardigan - a finished object! Over the course of the World Cup this year, I finished the “Whoooo am I?” cardigan as promised in my last post. 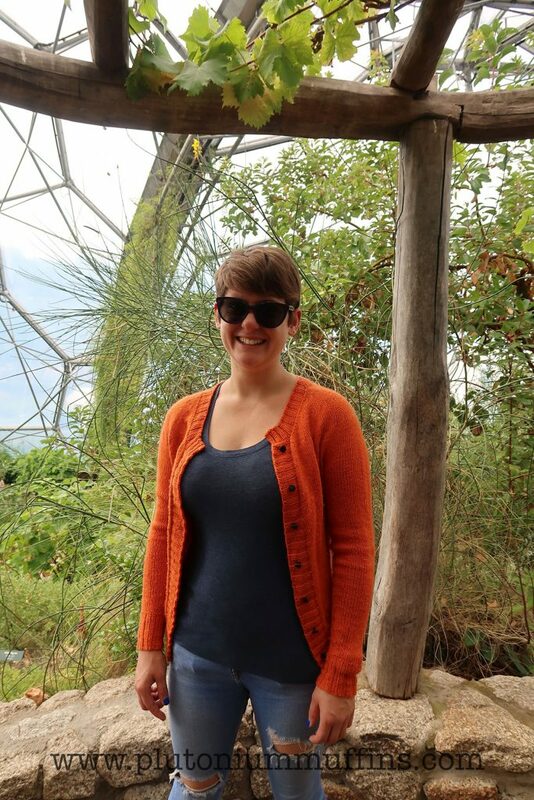 As also stated in that post, the weather is currently far too hot to actually wear the cardigan – we took the photos in the Eden Project and you can guarantee it got taken off the second the photos were done! Anyway, the sense of accomplishment and urge to keep creating has been absolutely worth it, and come autumn I’ll be happy with the addition to my wardrobe. 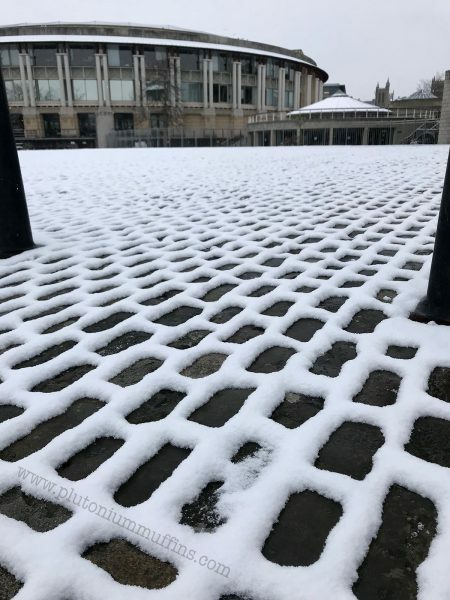 I absolutely adore this pattern. I’m a huge Harry Potter nut, I like birds a lot (if you follow me on Instagram you’ll probably be aware of this), and the pattern was the perfect combination of straight knitting and a bit of lacework to keep it interesting, while allowing me to zone out in front of the TV while I worked. I haven’t knitted a cardigan before, and it was a great first pattern to follow. My new cardigan, not buttoned up because it’s far too hot! As a knitter with a number of different techniques in the locker following years of knitting endless shawls and pairs of socks, one of the things I really battle with is picking up stitches. 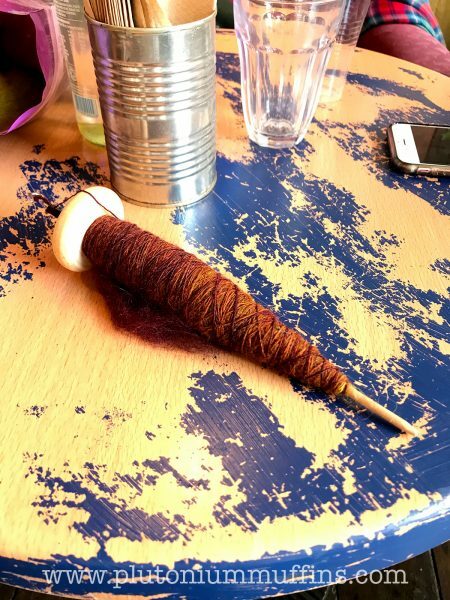 Years ago I took a class at “Spin a Yarn” in Bovey Tracey to try combat this fear…alas it didn’t really help, and I still have something of a mental block with the technique. Happily, there wasn’t anything too difficult to attempt, and although I don’t think I got the gauge on the button band quite right despite following a number of tutorials, once the cardigan is on you can’t tell! One thing I haven’t done, but still might attempt, is backing the button band with a bit of fabric. I see knitters doing this on Instagram all the time, and hadn’t really understood why until I sewed the buttons onto the cardi last week. I’m going to have a look through my fabric stash and read a few tutorials to see if this is something I might have a stab at, rather than avoid learning a new skill and wrecking it after only a few outings. From the back – the colour looks a bit darker here than it is in real life. Living for the owls. If I’m being totally honest, I don’t like the thought of doing this – although I’m handy with a cross stitch needle, actually sewing is something I’ve not got much practice at. Any tips would be appreciated! 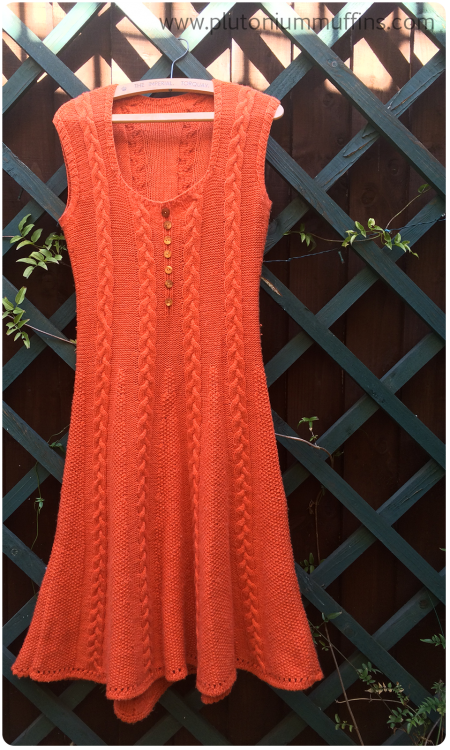 The yarn came from unravelling my Icon Dress, and while a pleasing ‘reuse, recycle, don’t leave hours of knitting abandoned in your wardrobe’ solution to a dress that no longer fitted and not wanting to purchase more yarn, this presented some unique problems in itself. The Icon Dress when I’d just finished it in May 2015. First, grafting. Some parts of the Icon Dress were so felted that when I was unravelling it I ended up having to large ditch portions of yarn, and ended up with a lot more ends than I had originally expected. I joined these using my favourite method (spit splicing) and ended up with what I’m choosing to call charming areas of slightly thicker stitches in my knitting. They’re probably only obvious to me, but also give the cardi a homegrown quality that I absolutely adore. The colour is still fantastic and I love it as much as I did when I bought it all those years ago. I’m so pleased I decided to go down this route rather than let yarn be the barrier to knitting the cardigan. One last thing to note here is the fact that the yarn pills like anything. I spend a lot of time picking bits off myself and think I’m going to have to give it a good shave regularly. Hopefully this is just the yarn objecting to its second life – we’ll see if it carries on doing it to the end of time. Needless to say, it will not become another project after this cardigan as I don’t think it’ll stand up to being unravelled again! 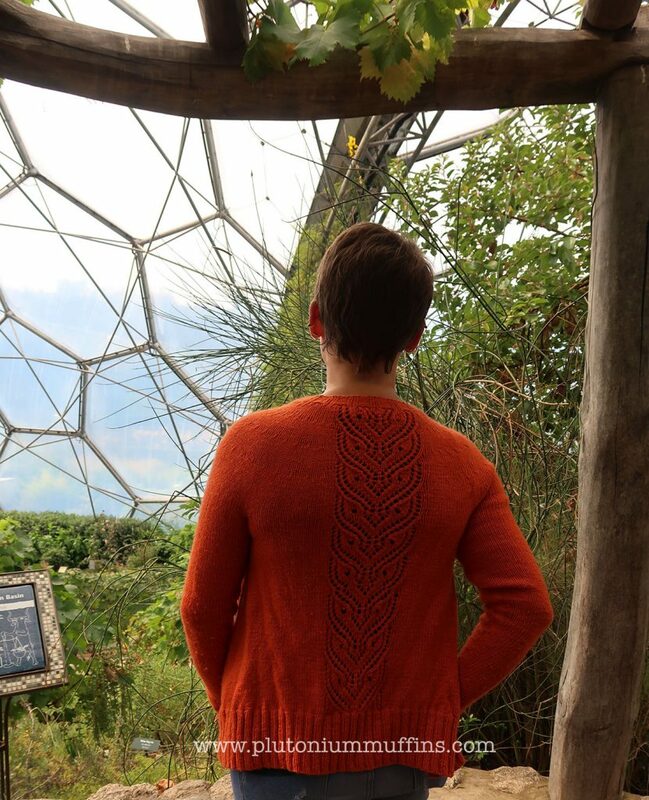 The cardigan from the back again – this one included because the pilling is really obvious to me, but it might just be me being a bit too fussy! My search of Ravelry proved really fruitful, and I’ve actually chosen another pattern from this magazine to attempt next. The Heliopath Vest is knitted in worsted yarn, and I have a medium amount of this languishing in my stash from when I visited New Zealand a few years ago. 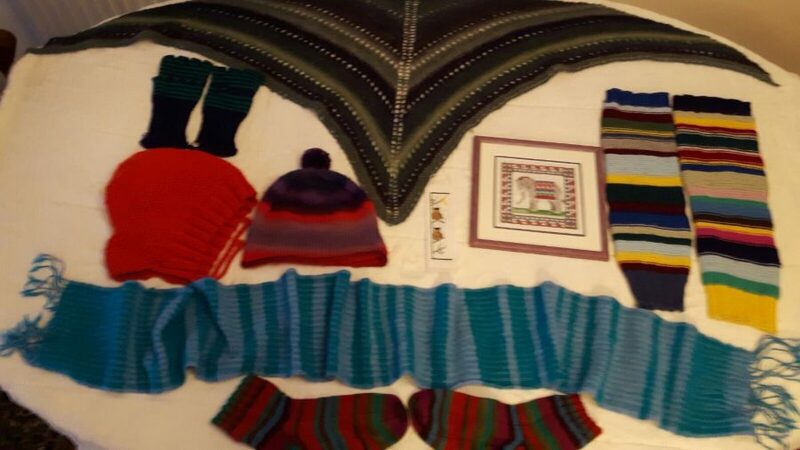 There isn’t quite enough for the full vest, so I’m going to have to have a look through the rest of my stash and try find something complimentary to go with the yarn I’ve allocated to the project – watch this space to see how I get on! 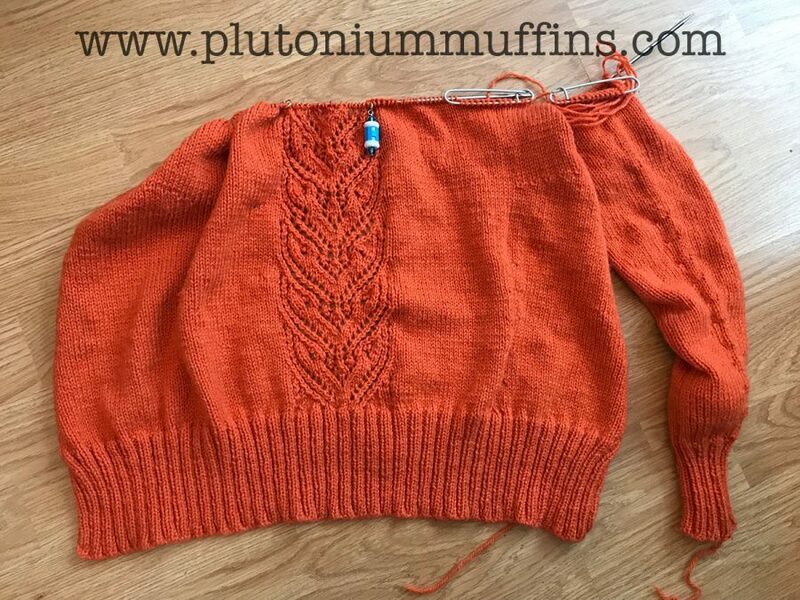 Before I start talking about my new cardigan project (and this blog post ended up being a monster, I really do miss writing), let’s address the fact that it’s been two months since I last posted with a little photo. 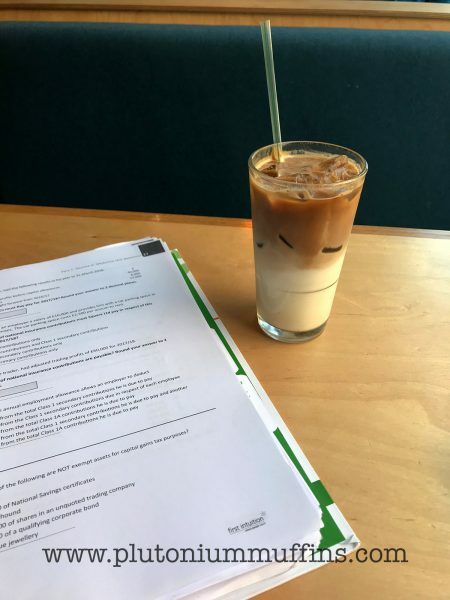 This has been my life for the last couple of months – two courses, two exams (one passed and the other results still to come). I was a bit cocky when I started training to be an accountant. 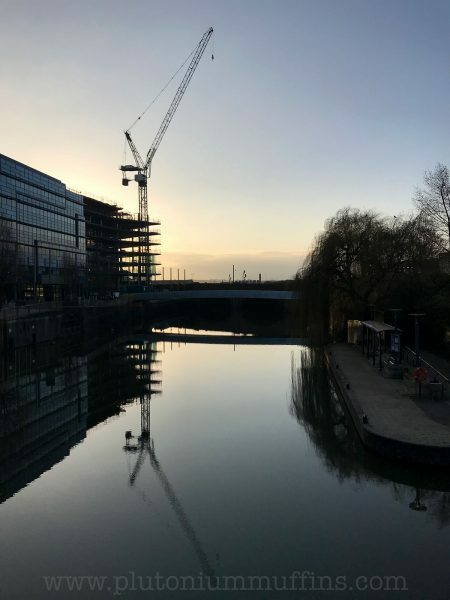 “I worked in finance while I studied full time at uni…the other way round should be the same, right?” was a constant refrain when I first started. Wrong. It’s hard to concentrate all day at work then come home and hit the books. This leaves little time for writing, knitting, spinning, cross stitch…and the rest, as I’ll explain. Anyway, I’ve got a month’s grace now and I’m celebrating by getting in a bit of all of the above before I go back to college. Those of you who have been long time readers will know I’ve been talking about knitting a cardigan for at least three years. The whole time I’ve been dreaming of it, I’ve known which one I was going to knit. I’ve never actually sat down and started it. There have been a number of reasons, but I’ve finally found the motivation to sit down and knit, and I am loving the project. 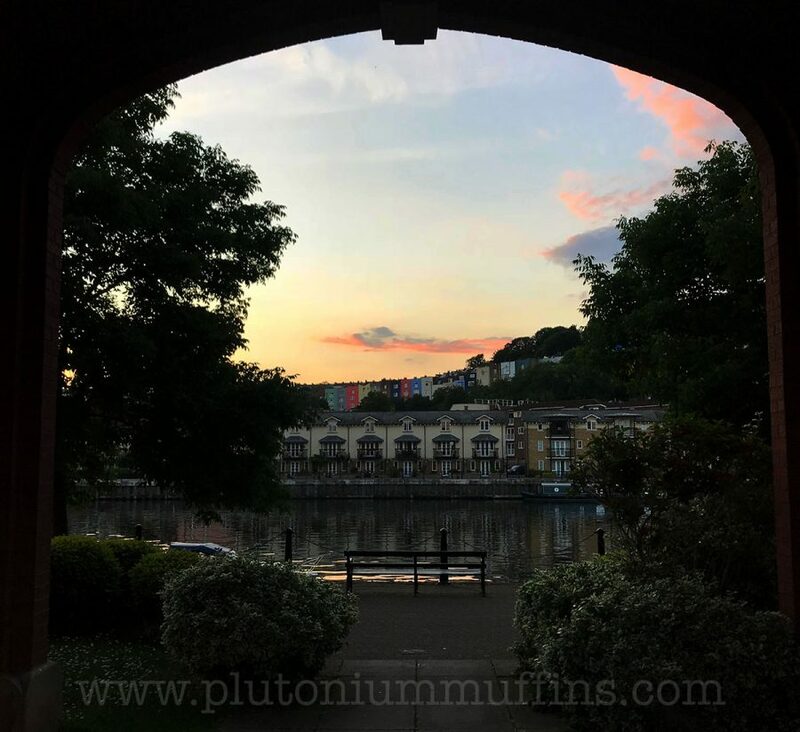 Recently my evenings have consisted of going to my favourite bench on Bristol Harbour and contemplating life, the universe and everything, to borrow Douglas Adams’ phrasing. I can’t say I exactly know who I am now, but I’m slowly coming to terms with unchangeable parts of me. One of these things is the fact that, despite hiatus and breaks from not only blogging but even looking at a pair of knitting needles, I always have been, am now, and always will be, a knitter. View through to the bench of dreams. Upon realising how much I missed knitting, I started taking some time to prepare myself to finally sit down and knit my cardigan. The other reasons I hadn’t started it began to lose their hold on me. I originally wanted to spin the yarn myself so that I didn’t end up buying a sweater quantity of yarn that would then sit in my stash for years. I have stacks of fibre, including some beautiful Exmoor Blueface from John Arbon that I debated dyeing for a while. The problem with this was it was essentially three projects in one: dye the fibre, spin the yarn, and assuming the yarn came out the right weight, knit the cardigan. The number of obstacles this presented proved too much for procrastination Corrie. My Kiwi wheel has some fibre on the bobbins that I’ve been slowly working on for a year, and I can’t justify buying new bobbins at the moment. The Traditional is currently in storage following the most recent move, and although I have tons of empty bobbins for that, I can’t have the Kiwi and the Traddy in my room at the same time. It wouldn’t be particularly pleasant going and sitting in a storage container and spinning in the evenings! Luckily, one of the other things I’ve done over the last year has been to lose a lot of weight. I gave up sugar in September and now try to eat only things that contain 5% sugar or less. Mostly, this meant I stopped drinking coke and eating chocolate. Combined with running, eating more healthily and trying not to snack between meals, I got to the point where I’d lost three dress sizes. How on Earth is this relevant to yarn? Because of this. The Icon Dress, which I finished in 2015, no longer fitted me. There was £70 worth of prime Knit by Numbers John Arbon yarn in there, in the right weight, in a colour I still love. Without thinking about it too much, I sat down and over the space of two months, unravelled it. I had a lot of people asking me how I could possibly bear to do this. 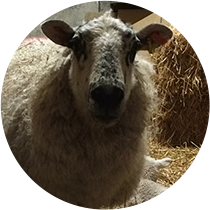 It must have taken me hundreds of hours to knit – what was I thinking? The thought of the dress lying in my cupboard, never to be worn again until I piled on the pounds, was less bearable than taking it apart and repurposing it into something I’ve been wanting to do since I finished that dress. It wasn’t a hard decision at all. One of the other things that really put me off was gauge. I am really quite a lazy knitter and the necessity for swatching is something that I acknowledge, but always hate. Having yet another completed swatch lying in my box of swatches bothered me. Eventually, having put all that work into unravelling the dress, skeining up the yarn and resetting it with a good bath, I decided to pull up my big girl pants and get to it. As with all things you avoid, it took me approximately a fifth of the time my head told me it would take, and I completed the swatch while watching a good game of football. 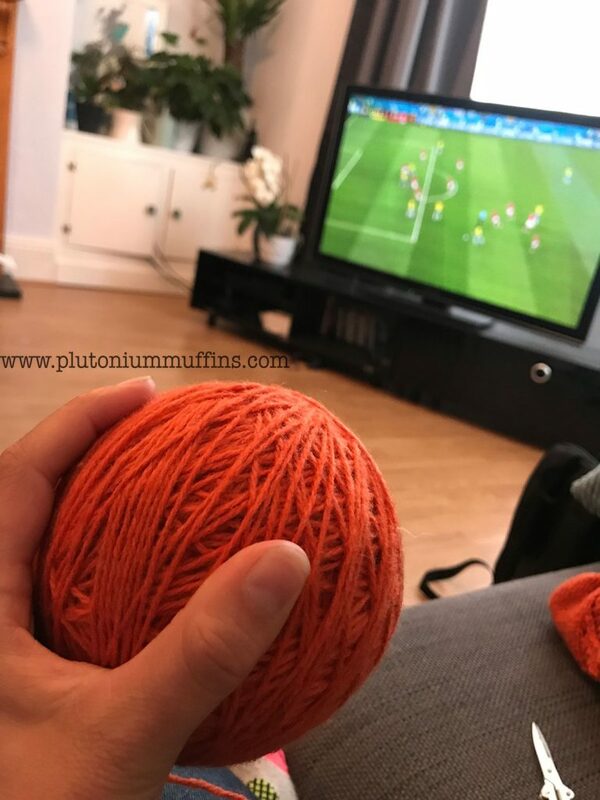 Watching football with knitting, a pleasant past time! Then came the measuring. To my horror, my gauge was slightly off. I am quite a tight knitter, and it was a little bit out – but not by enough for me to reswatch with bigger needles. I used 4mm to do the swatching, and would have to move up to 4.5’s – I’m convinced this would have given me a gauge that was too loose. Looking at the measurements of the cardigan, I also thought that if I went for the size dictated by my bust, it would end up fitting up top but being too loose around my middle. These are the hazards of being gifted in the bust department (I’ll let you decide if that’s a blessing or a curse – I certainly know which of the two I think it is, and it’s definitely the latter). With a slightly tighter gauge I thought I would solve that problem. It remains to be seen whether I’m right or not. 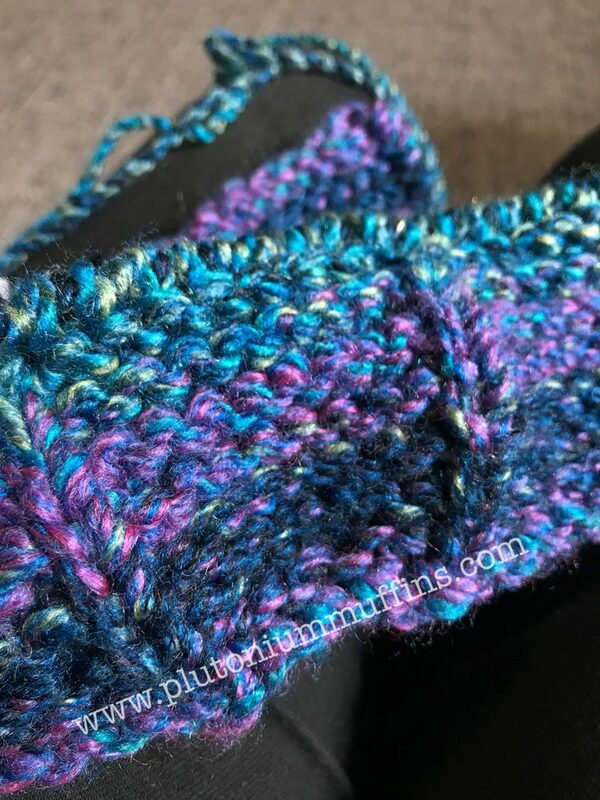 When I got started on this blog post a week ago, I’d already started knitting the cardigan and was about a centimetre through the bottom ribbing. Fast forward to this week, with hours spent in front of the football, a few days in Devon with my family and an afternoon sitting in my favourite cafe with a friend, and I’m more than halfway through it. This has been the most gratifyingly quick knit, and I’m incredibly fired up and inspired to start knitting in earnest on all the things again. The pattern is Ginny’s Cardigan from Interweave’s “The Unofficial Harry Potter Knits, Special Issue 2013”. It’s the cover pattern, and there’s a certain poetry in the fact that I’m knitting it in bright orange yarn given the nature of Ginny Weasley’s hair colour. I finished the first sleeve yesterday, although I think I’m going to go back to it and make it a bit longer. With another afternoon of football to look forward to, I expect I’ll finish the second sleeve today, and hopefully get some time to join it this week. I often seem to do this – start big projects that aren’t weather appropriate in mid-summer. I doubt I’ll be able to actually wear it until the seasons change again – but given that I might have to undo it if my gauge is wildly out, and also that if i started it in autumn it might not be ready till even later in the year, I’ll take it. 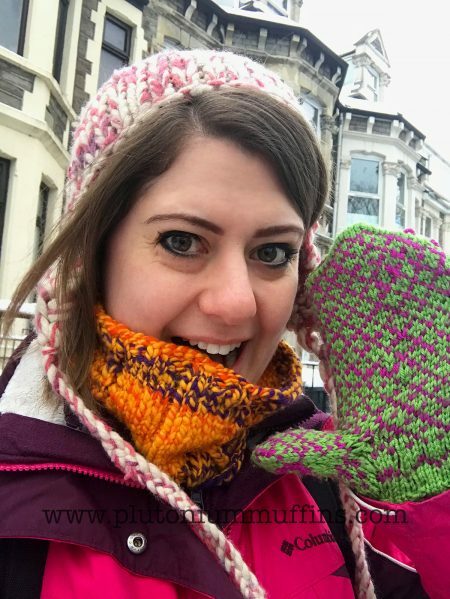 Having a pair of knitting needles in my hand is wonderful – I do remember how to knit (I was honestly a big worried haha) and the therapeutic effects of slowly working my way through a pattern have been remembered gratefully. One sleeve to go back and make longer and the rest of the cardigan as it stood at the close of play today. 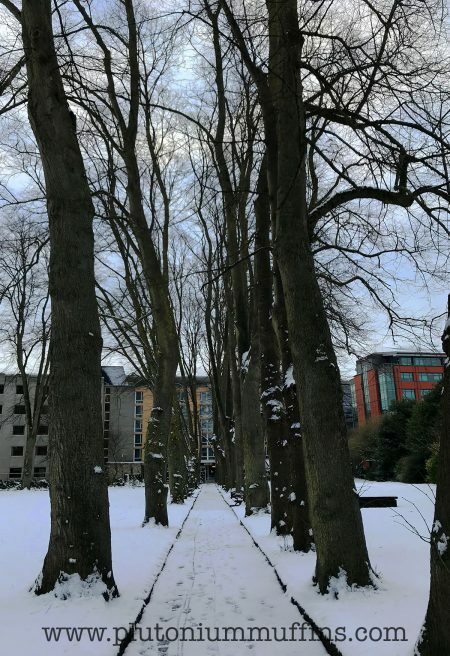 I’ve been in a reflective mood recently, and have spent a lot of time drafting blog posts trying to put that feeling into words. 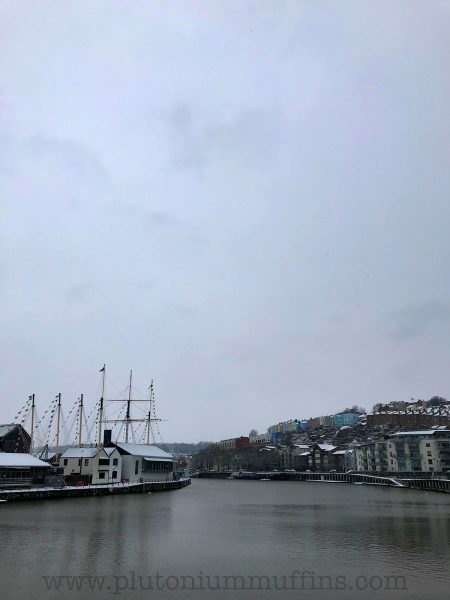 As I was taking a walk around Bristol Harbour this morning, I realised that my feelings about time itself were one of the things I was most reflecting on. 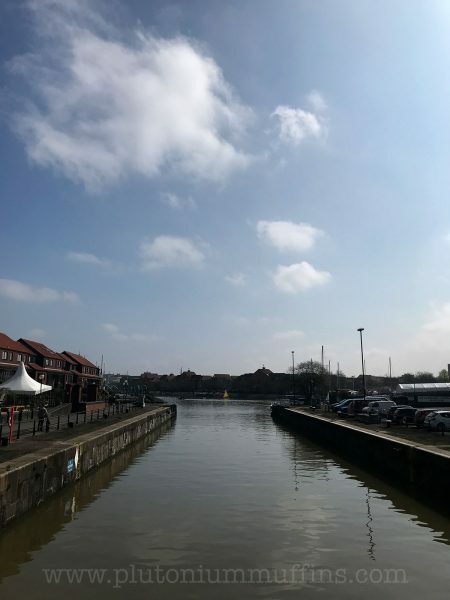 The long and short of it has been that the space between my daily milestones – the alarm going off, breakfast, the lunch break, dinner time, back to bed again – has come to mean a different thing to me in a relatively short space of…well, time. 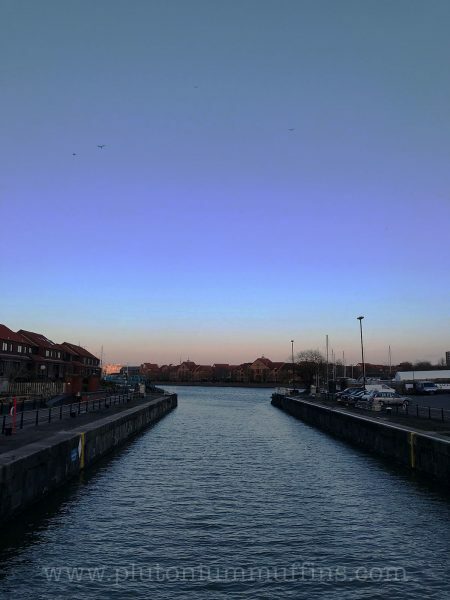 Throughout my life I’ve had moments, sometimes daily and other times spaced months apart, where I’ve sat back with a bit of a start as I’ve realised that the moment I’m experiencing is utterly unique and will never again exist. I can remember sitting back on countless occasions and thinking to myself ‘remember this moment’. Of course, I don’t remember the moment itself – where I was, what I was doing, who I was with – but instead the actual act of sitting back and thinking to myself “remember this moment, you’ll never have it again”. Remember this moment, you’ll never have it again. It was one of the only useful things a therapist ever said to me. The way I experience the thought of ‘wasting time’ has since been subtly changing. Taking craft as an example, I used to be a goal oriented knitter, with the finish object being king and the time spent knitting it ‘wasted’ as I was so keen to reach my destination. Cranking out object after object, often with imperfections that I knew about but ‘didn’t have the time’ to go back and fix, I was perfectly happy with that style of creating. 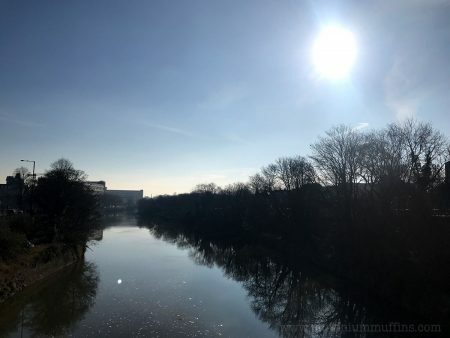 Sunrise over the River Avon, a view I get to appreciate every day in all weather, light and circumstance. More recently, I’ve started to enjoy that ‘wasted time’ more. 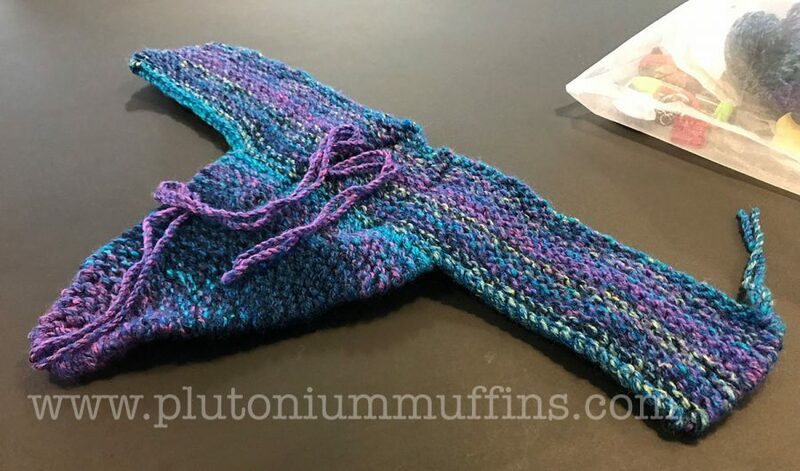 The Pixie Slipper Boots that I recently completed felt almost unreal because they were so quick to work up; I’d barely begun to appreciate them before they were finished. The chance to sit down and enjoy the act of throwing the yarn over the needles, forming stitch upon stitch upon row and row, cherished. I’ve become focussed on drop spindling again, the slowest form of crafting that I do, and in this moment, the most desireable. I’ve even started to unravel one of my biggest ever projects because the imperfections I forced into it through my impatience have driven me to never want to wear it, and instead of seeing the time spent on it as wasted, I’m loving the opportunity to breath new life into it – that yarn has triple the mileage of any other project I’ve ever done! Drop spindling fibre that I rediscovered when I moved – this has gone from place to place with me recently, pulled out when I’ve felt I needed it and enhancing my reflections on time. One of the most significant changes has been how I approach the time I’m not crafting – which to me, used to be the biggest waste of time in my daily life. I wouldn’t allow myself to watch TV without a project in my hand, and the thought of going to a cafe or pub and not taking something to occupy my hands with me was almost unbearable. I don’t always pack knitting in my bag anymore – and sometimes when I do, I don’t take it out as soon as I sit still. 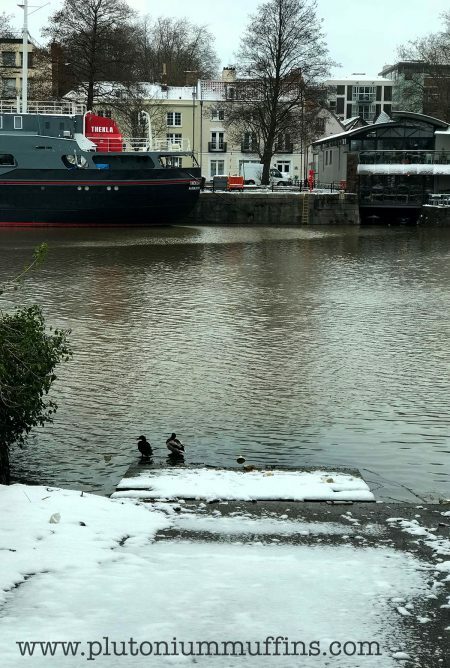 My walk to work is often meandering, and I take the time to appreciate the view, observe the swans that live in the harbour, enjoy the great British weather in whatever form it takes. I stop at a cafe on my way home from work, just because I can. 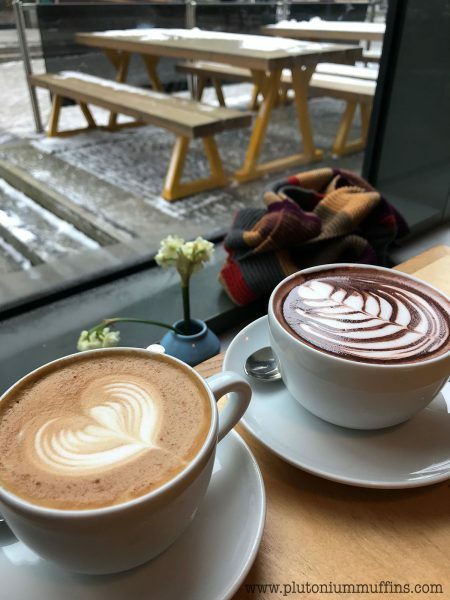 I’ve spent a lot of time in this cafe recently – Mokoko on Wapping Wharf, Bristol. 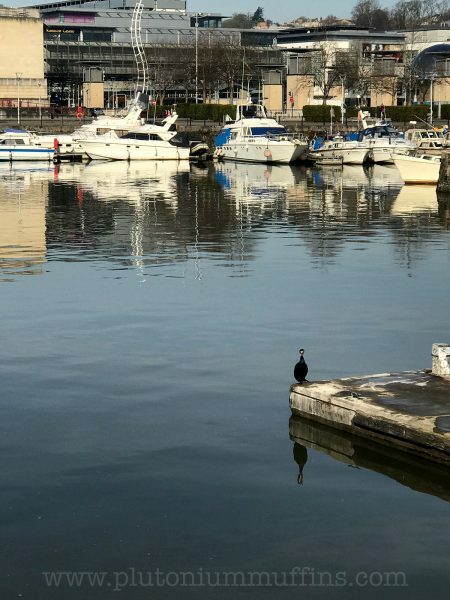 My runs are getting longer and longer because the act of just being out and about is no longer about running between A and B as quickly as possible, but exploring my area and experiencing the ways my body works. 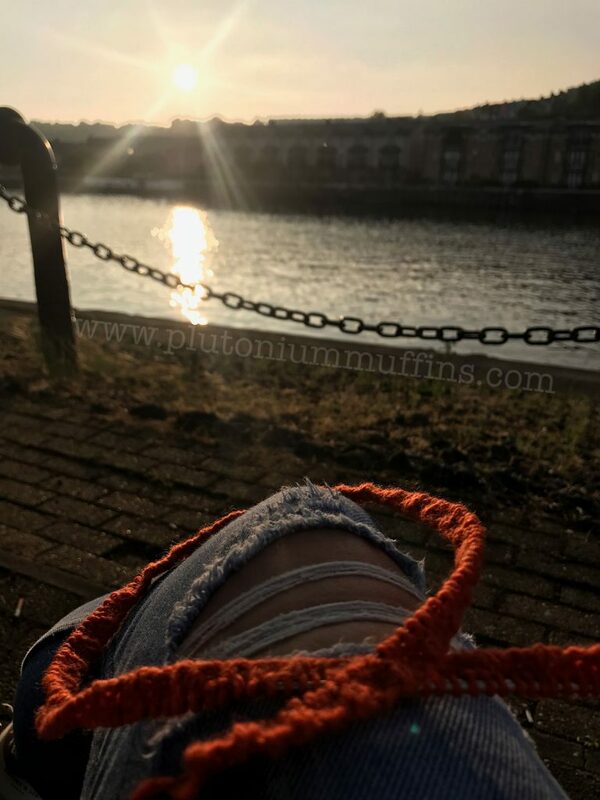 I’ve started allowing myself to sit and do nothing – and when I get freaked out about that, I’ve been reminding myself that it’s actually OK to just be, and if I have a problem with it I can just pick up the needles again. I’ve even found myself appreciating my relationships more. Instead of wishing I could spend more time with people and being sad that they can’t dedicate as much of their time to me as I would like, I’ve found greater appreciation in the time they do spend with me. 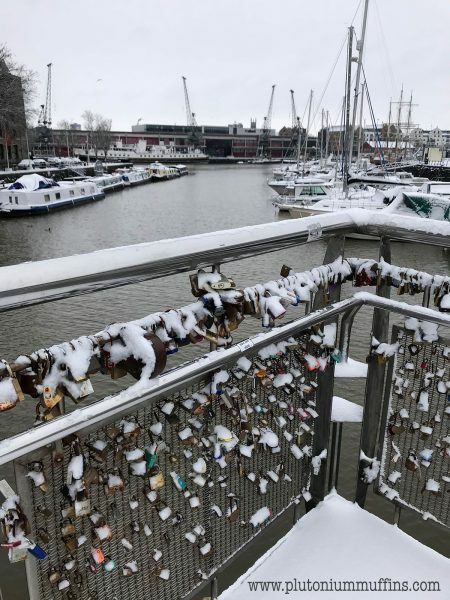 It has taken the pressure off the relationships a little bit, and also made me cherish them that much more – something that is incredibly important to me as I get older and (theoretically!) wiser. 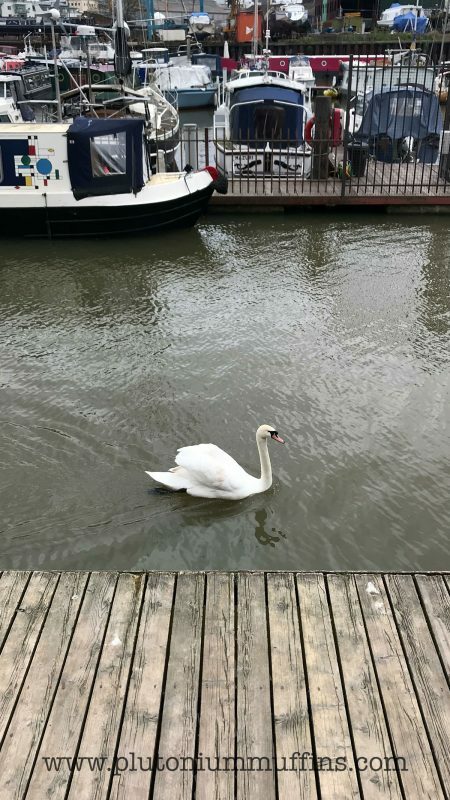 Swan in Bristol Harbour – I’ve nicknamed him Frank and see him almost every day. I guess all of this might mean I’ve learned the art of mindfulness, and am slowly becoming successful in my quest to rediscover who I am. All of this time spent on not focussing on finished objects has meant that I’ve actually been quite productive on a crafting front, but I haven’t necessarily wanted to sit down and write about it. 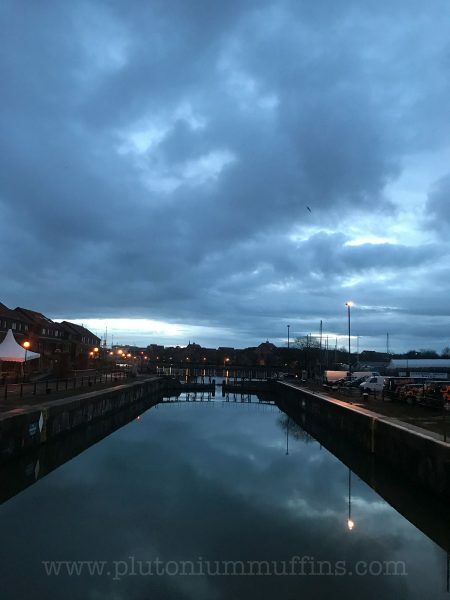 For now, I’ve started using my Instagram story to share more moments of my day – the fleeting, 24 hours the photos stay and the snapshots they capture are really calling to me at the moment, and you can see them here! Reflections on mirror calm water at 6am. And the same view a couple of weeks later in bright sunshine. 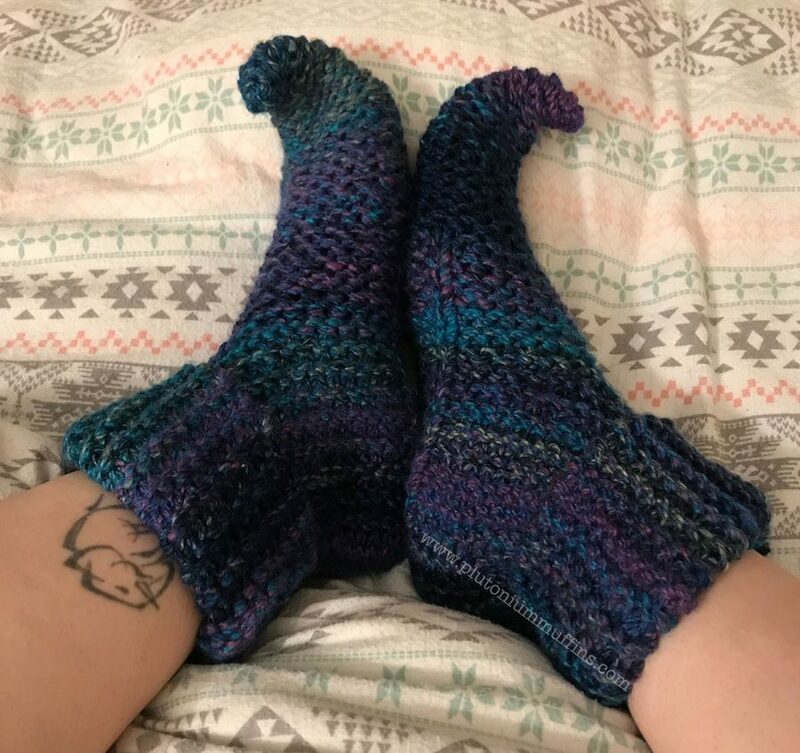 Last week I finished the pixie slipper boots, the first knitting project I’ve completed for myself in, wait for it….well over a year. Every year for the last few I’ve made the resolution “make more stuff for myself”, and every year I seem to just get worse at this. Never mind, the dry spell is over and I now have my very own fancy elf-like slippers to pad around the house in. I bought the Pixie Slipper Boots kit from the Wool Shop Leeds when they were exhibiting at the Stitching, Sewing and Hobbycrafts Show last summer. Ricky also bought the kit, and with the pattern has made not one, but two pairs of slippers. Meanwhile, it’s been languishing in my “someday, maybe” pile ever since. I moved house a couple of weeks ago, and in the move discovered a basket full of my ‘someday, maybe’ kits. I’d been desperate to get some simple knitting going for a quite a while, so the timing was perfect. I cast on, and while I was visiting a friend on maternity leave I knitted at least half of the first boot. One of the things most new knitters ask me is “how do you make sure it’s the size you want it to be”, and most are upset when I say gauge is king. While sizing wasn’t too much of a problem with these slippers because you just knit until they’re big enough, the other issue with needle sizes came up. 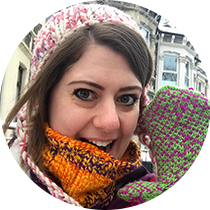 When you’re knitting, you’re making yourself a fabric – and if you don’t like the fabric you’re making, you will always find it a little harder to love your finished object. I started out knitting with 5.5mm needles, rather than the recommended 6mm as specified in the pattern. Because I was knitting slippers, which would have to be hard wearing, I thought I wanted the fabric to be more dense. This plan was quickly revealed to be a bad one – the fabric was so dense it was actually hurting to knit, and it was so stiff that I decided it would actually be pretty uncomfortable. The start, with knitting far too dense, didn’t last long before I undid it. I undid the first half of my slipper and started again with 6.5mm needles, because I couldn’t find my 6mm ones. Much happier, I carried on. Let the lesson here be that even if it’s a faff, it’s better than finishing something you’re not happy with because you’ll probably wear it less and thus the time was wasted anyway! I started these on Thursday, and by the following Tuesday they were done. 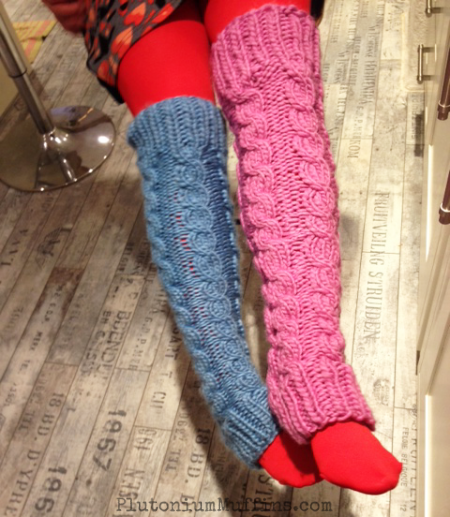 The pattern uses a super bulky yarn, which is held double and as a result simply flies off the needles! It’s nice and simple, and a great way to practice mattress stitch as well – each slipper starts out as a flat piece that you sew up. A Pixie Slipper Boot before assembly. Finished slippers, sans the bells I bought to put on the ends because I got too annoyed with them. I got the point better on the first one than the other, which was a nice departure from tradition as I’m normally better at finishing the second item in any pair! They’re super comfy and the only problem I’ve so far experienced has been that I got my laptop charger wrapped around the point of one of them and nearly went flying…user error rather than an issue with the knitting! My main gripe is that I like slippers to have a hard sole, so I might actually cut the top off my old slippers, which are about two years old and nasty, then sew the old sole onto the base of these. I’m not too sure about this plan yet, so watch this space! The project was super simple, really quick, and a great way to get me back into knitting after a long hiatus. Next up is some spinning I also rediscovered while I was moving – watch this space! The baby boom is (almost) over! The last one of my friends to leave work on maternity leave has gone, and with her all my requirements for baby knitting. 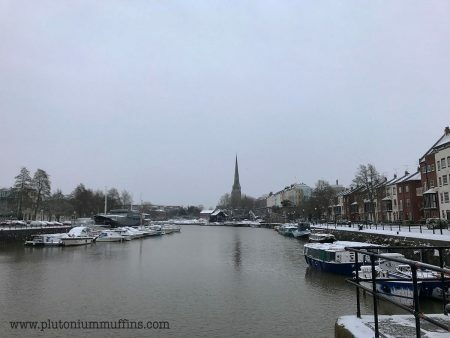 I haven’t blogged about this for a little while because I’ve moved house again (how many times is that in the life of this blog…? Eight by my count in the last six years…) so here is all the knitting I’ve done since finishing the crochet blanket I wrote about here. I spent some time over Christmas knitting some booties for two of the pregnancies, one of whom was my line manager and expecting a little girl, and the other expecting a baby of unidentified gender, who is going to be living in a grellow nursery. This pattern was extremely easy to knit up, and very quick indeed, and from a book that, if you are expecting any sort of baby boom in any part of your life, I thoroughly recommend. The pattern is from “Knitted Animal Nursery*” by Fiona Goble, and I genuinely love it so much that I bought it on my Kindle as well as the physical copy so that I could have it with me when I was brainstorming ideas even if I hadn’t taken the actual book with me. 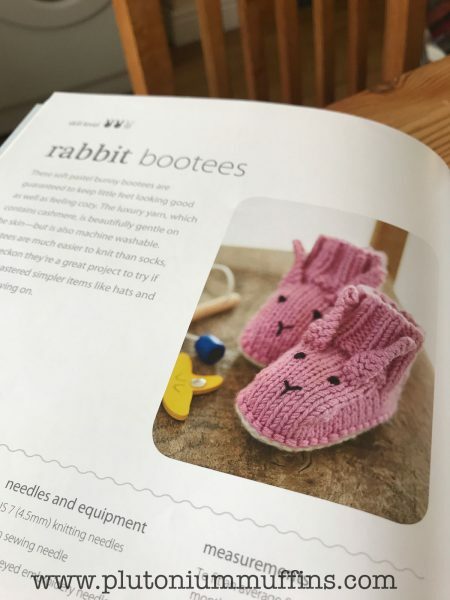 Find the pattern on page 60 – “rabbit bootees”. 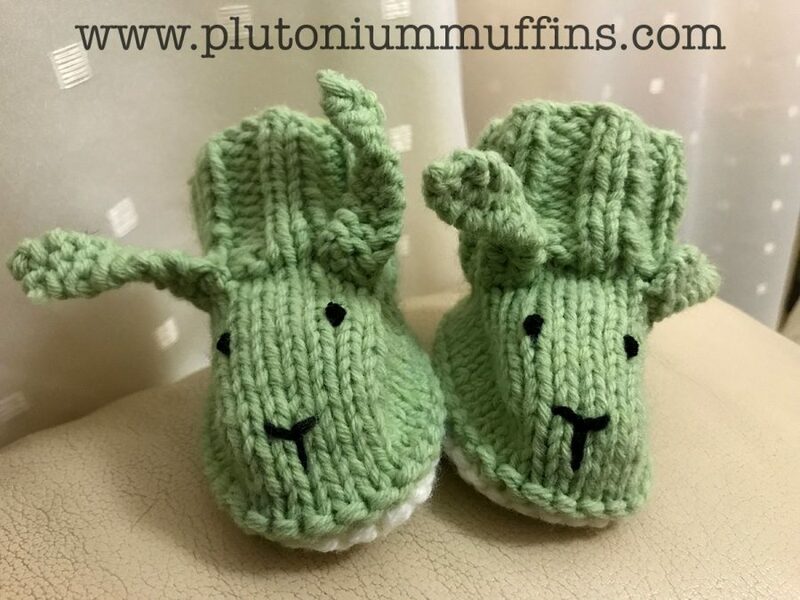 Bunny bootees as shown in the book. The recommended yarn is Debbie Bliss Baby Cashmerino, but I used Sirdar Snuggly DK, and the first pair in green was for the little girl, because I don’t conform to colour/gender stereotypes haha. 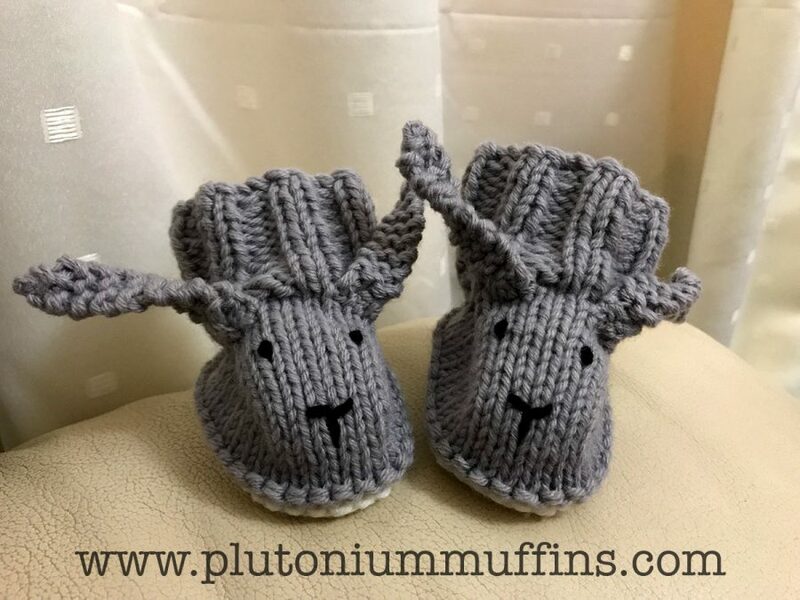 The grey was for the other, and the second pair I knitted – each one took me about half an hour, and are so ridiculously cute that I’ve had requests for adult sized ones after I took them into work! Bootees for a little girl, no gender stereotypes here. Grey bootees, second pair and a bit better put together! They were well received, and I can’t wait to see them on the babies when they are eventually in the world. 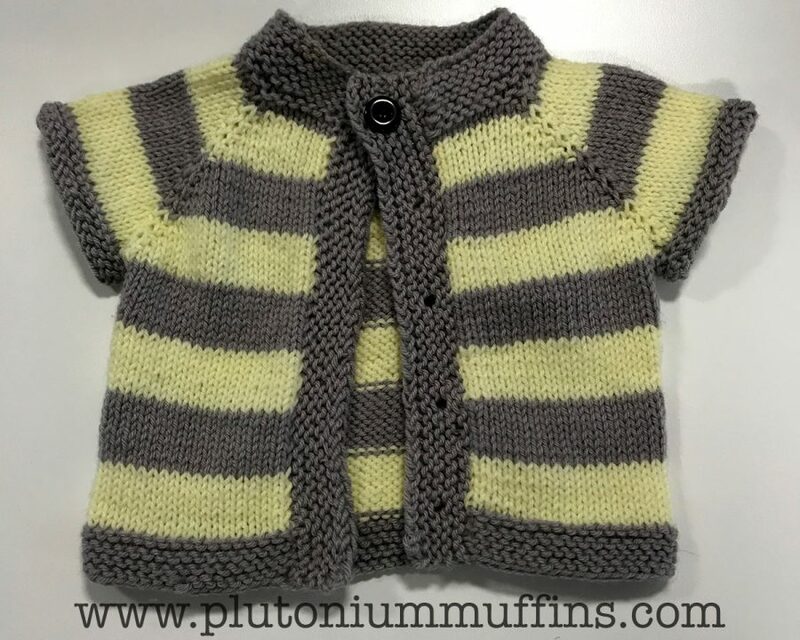 The Fuss Free Baby Cardigan was the second project I knitted for the grellow baby. I went for this because I wanted something that was quick and could tie in with the bootees. We’d also bought a lot of yarn for the crochet blanket, and as the mother of this baby was the person who crocheted half the squares for the blanket with me, I thought it was a great homage to that work. I put a row of full buttonholes in, but when I sewed the top button on, loved the look with just that one, so I left it without any of the others. I think this might become my go-to pattern, especially because I have so many scraps of yarn that would be perfect for making lots of stripes. Plenty of sewing in of ends coming for me! What is your go to knitting pattern for fuss free baby stuff? I’d love to know! I’ve fallen a bit behind on my year of giveaways, so these were the winners, doubled up to make up for my missed weeks. This post also sits in the Year of Giveaways – for more information, click here, and if you’d like to enter please leave a comment on this post! This post forms part of the year of giveaways. Comment down below with your thoughts on the topic to win! 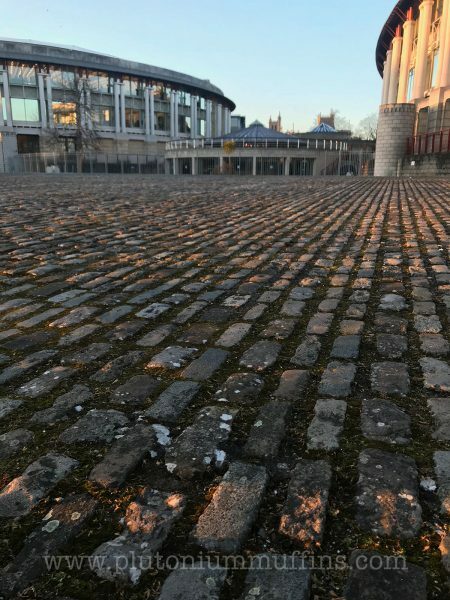 A deadline: One year late is better than never? 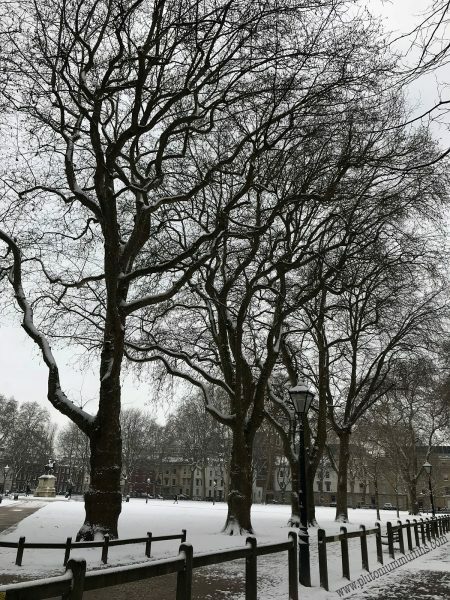 It’s pertinent that the next thing I wanted to blog about was deadlines, deadline knitting, missing deadlines, being late for deadlines….because here I am a month later having missed all my self-imposed deadlines after a good start to the year. I’m most annoyed about this, but has been the consequence of some personal stuff that I won’t be talking about here. Suffice to say the year hasn’t taken the direction I really expected it to, and my focus has been taken from the blog somewhat. I’m going to keep trying – you’ll just have to be patient with me! I did already talk about this topic over on my YouTube channel, in a live stream I was totally unprepared for and also completely blind-sided by as my friend from work discovered I was doing it and sent me some very off-putting text messages before. If you want to have a watch of that, it’s over here. Pleased as punch! A deadline missed by a mere five years. I experience a weird phenomenon when it comes to working to a deadline. I either freeze up and miss it entirely, or it becomes my entire focus until it’s done, with the consequence that the item is ready so long in advance that I almost forget it exists. I’ve spent a long time trying to figure out why this is, and even longer trying to thwart it. I’ve prepared gift lists and diary items, put reminders in my phone “cast on mum’s birthday present” and even told people what I was making them in order to force myself to finish on time. That has been the worst tactic so far, and my poor mum has been the one to suffer from it the most. I finished knitting her birthday socks on her actual birthday sitting at the table for her dinner one year, graduating to presenting her with one completed leg-warmer one Christmas with the second following a year later (in a different colour), finally getting as far as taking her yarn shopping on her birthday, then not presenting her with the present until 18 months later. Bad Corrie, bad tactic, very patient mum still wears the things I’ve made for her and doesn’t call me out on this tardiness! I’m sure this is something that I’m going to keep working on for the rest of my life, especially as I find it really hard to allow myself to just buy presents rather than making them. I’m sure, knowing my family, they prefer the homemade stuff and it doesn’t bother them…spending money on unwanted stuff rather than time on things made with love is definitely the preference. It just means that I’ll have to put up with comments like “do you remember the time you gave me a pair of leg warmers a year apart” for the rest of my life! Two very odd leg-warmers indeed. How do you cope with deadlines? Have you found anything that really helps you with them? I’d love to know some new things I can try to improve my timeliness with meeting a deadline. This post has been part of the year of giveaways. To be in with a chance of winning a digital craft pattern of your choice, leave a comment below on your attitude to deadlines. For full terms and conditions, check out this post here. This year, my lovely gran has been showing appreciation for the makes I’ve gifted her over the years by sending me WhatsApp messages and pictures talking about them. In the past she quite regularly sent me photos of the items in use as well. It’s absolutely blooming lovely! In this blog post, I made reference to the fact that once you hand items you’ve made over to their intended user you can sometimes never see them again. It can be quite demotivating not knowing if they’re being appreciated, or if you should have just gone for a shop-bought thing instead. Ever since writing that post I’ve been really paying attention to what I see others doing with the bits I make them, and I can say with confidence that the apparent lack of appreciation that I perceived last November is without a doubt a figment of my imagination. Bits and pieces made over the years for my lovely gran. I know that I’m going to keep crafting for others regardless of how errant thoughts try to make me feel about it. I think part of the reason is that glowing feeling I get when I go home and my mum is wearing the Zion hat I made for her, or I get a photo and the baby I crocheted a blanket for is warmly swaddled. For all of those things I’ve made that I don’t see again, those that I do more than make up for it. I even think sitting around moping about it makes seeing the objects all the sweeter. Let me explain before you think I’m crazy – I’ve built up in my head this expectation that these things aren’t appreciated because they’re always out of sight; so when I do see them they’re like glowing jewels that seem all the brighter for the dark background my expectations gave them. I know for a fact that many of the things I don’t see are appreciated more than I give them credit for because people tell me about this appreciation, and for this I’ll always be grateful. If it stops, will I stop making? Almost certainly not. One of the first things I ever knitted! 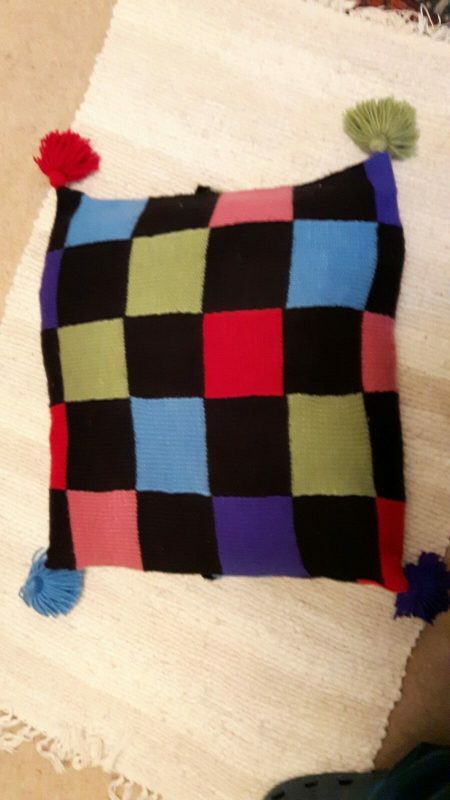 A patchwork pillow that has received a lot of appreciation over the years. I’m interested to know who you make for, and if you know why you do it that way. Do you feel that things you’ve made for others have attracted the amount of recognition you feel they deserve? Does it inform your decisions? Comment on this post before the 28th of January 2017 for a chance to get something in the Year of Giveaways! The winner of last week’s pattern was Jennifer Clucas, congratulations!